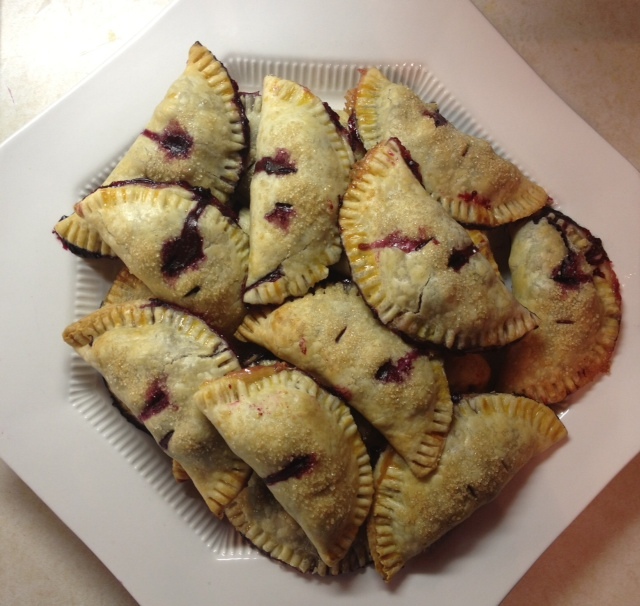 Blueberry Hand Pies! Because sometimes, pie is all that will do…. Alright, here’s my Opus Dei intro: I did make something incredibly healthy this weekend- shout out to Iowa Girl Eats and her Superfood Salad recipe. Delicious! Photo of my version below. After I was full of pomegranate seeds and grilled shrimp and quinoa, I felt a tugging at my heart strings to get crafty and start cleaning and baking. What’s that, heartstrings? Have a Pinterest project fiesta and punctuate it with the baking of mini pies? Well, alright! Let’s make some mini pies (you’ve certainly had worse ideas). Thanks, heartstrings! So here’s my dinner main course, which, when added along with the salad to my list of meals for the day, was a wash. Maybe. Super-simple, delicious, and fancy. And my coworkers loved them today. In a large mixing bowl, toss the blueberries with the lemon juice. 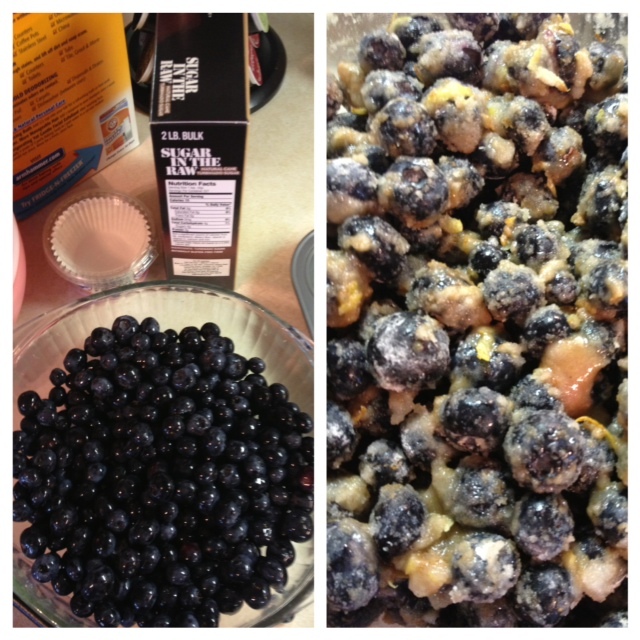 Add the sugar, cornstarch, cinnamon, and lemon zest and stir carefully to coat, not breaking the blueberries. This recipe would work well with other berries, or with the addition of ricotta cheese for a richer take (1 tsp ricotta, 1 tsp berries). Whisk the egg yolk and water in a small bowl to make your egg wash, and set aside. Meanwhile, roll out your pie crust and use a 5″ diameter (or thereabouts) bowl or jar to cut out little discs of dough. I dusted a cutting board with flour and rolled out my Pillsbury dough a bit to make it stretch. When you’re left with scraps, roll them into a ball with your hands and roll out again. You should be able to use almost all of it, and if you nibble on the little leftover pieces of dough, I won’t judge you. This recipe made 22 pies, so by all means, halve it if you’re not cooking for an office full of dessert enthusiasts, as I was. 11 hand pies is still a whole heck of a lot of hand pies. I mean, you only have two hands. 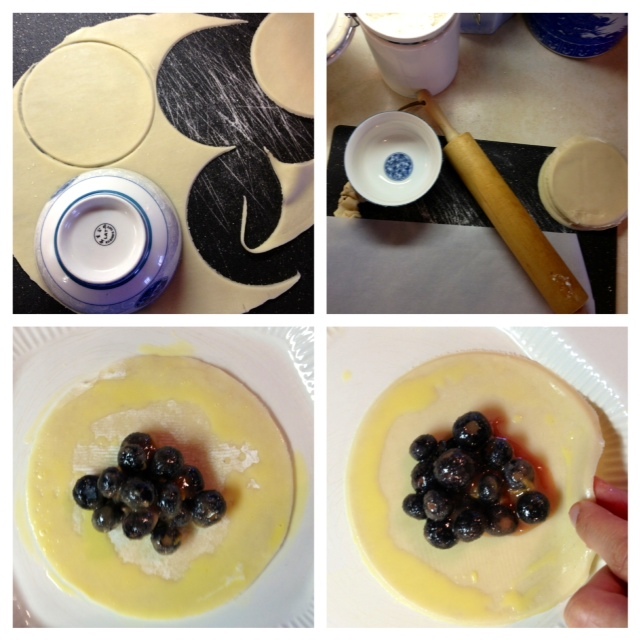 For each pie: stir the blueberry mix again and spoon a heaping tablespoonful of filling onto the center of a dough disc. If you’re using a larger or smaller bowl to cut discs, adjust the amount of filling used per pie. With a pastry brush, brush the egg wash onto the edges of the disc, in a circle. Fold one half of the disc over, and crimp with the tines of a fork to seal. Place the pies onto a parchment paper-lined cookie sheet and when the sheet is full, refrigerate for 30 minutes. If you make the whole recipe, you’ll fill two large cookie sheets. 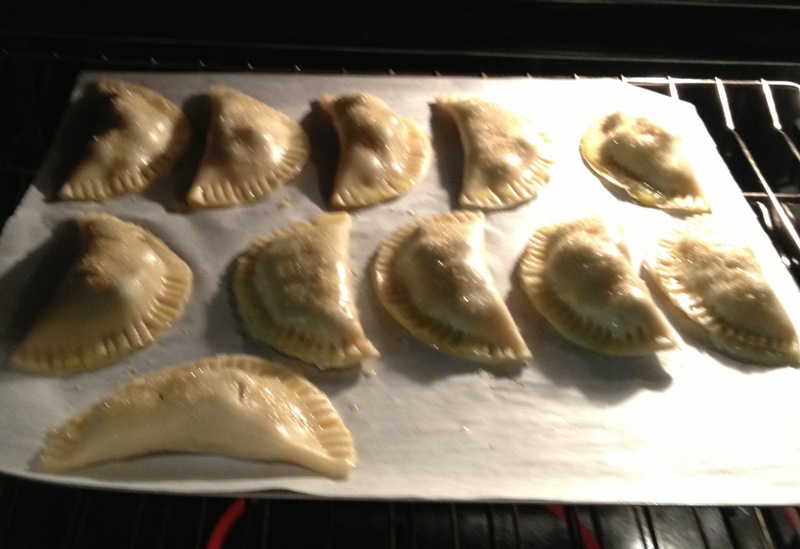 After the first batch of pies has been in the fridge for 30 minutes, preheat you oven to 375. Brush the egg wash on each pie, sprinkle liberally with turbinado sugar, and cut a slit or two or a fun shape to vent each pie. I opted to transfer them to new parchment paper at this point. Bake those bad boys for 23-25 minutes and let cool completely before you serve. They may still leak a bit as they bake, depending on how fully stuffed they are, but don’t panic if you see that happening in the oven- they’ll still be filled and delicious. If you can’t wait for them to cool, eat two of them piping hot as your dinner! Best dinner ever! Very good with vanilla ice cream. Store in an airtight container, at room temp. baking away! notice how they’re facing each other, and not the edge of the sheet in case of leaked filling. 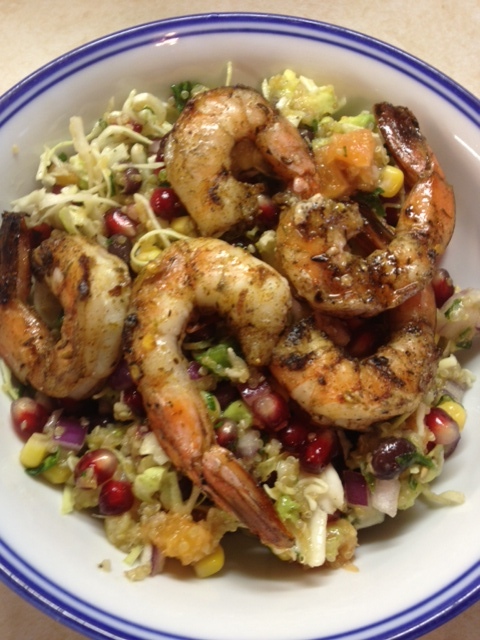 Here’s the IGE Superfood Salad I made in honor of the Super Bowl (and was the only Super Bowl-related thing I did do). I added grated fresh ginger to the dressing and shredded cabbage to the salad. I tossed some shrimp with Caribbean jerk seasoning and cooked them on a very hot, oiled grill pan, about 2 minutes per side. I bought one large pomegranate and just popped the seeds right onto the salad. It was great! This entry was posted in Baking, Classics, Dessert, Easy, Fancy and tagged berry pies, blueberry hand pies, blueberry pies, blueberry turnovers, hand pies, individual blueberry pies. Bookmark the permalink.